North’s Focals smart glasses is a respectable attempt at pioneering consumer-focused smart glasses. With a stylish design, it can actually sit on your face without making you look robotic. The projection display is extremely impressive; vivid, colorful, and fluid, it’s glanceable notifications at its finest. You only need to scroll through them using the tiny control loop. In addition, it comes with a rich set of peripheral functions including Amazon Alexa voice command – a must to enable advanced functions – and colored lens attachments. Being a first-gen product, however, it still has too many rough edges to be a proper daily device. While its $1,299 price tag is more affordable than most of its competitors, it still stings the wallet of an average consumer. By far the best-looking smart glasses ever made. Voice commands through Amazon Alexa. Water and dust resistant; Glass is rated for IP55, and the loop is IP66. Physical locations in Toronto and Brooklyn means in-person support. Can get warm after a few minutes of use. Brevity is the soul of wit. The idea behind smart glasses is to give the user a way of immediately and briefly interacting with critical information. As opposed to pulling out your phone, a quick glance is all that’s needed to check relevant info. Its ideas are certainly founded: Information is kept safer from prying eyes, your actions are less noticeable, and it’s definitely faster than checking a phone. But smart glasses seems to be the future of yesterday. Though they have a place in specific enterprise use cases, due to their high-cost, niche market, and a number of technical constraints, they were doomed to be another piece of cool tech that no one would buy. North, on the other hand, is set on revitalizing the silent market with its Focals smart glasses. It’s looking to do this starting with the design. 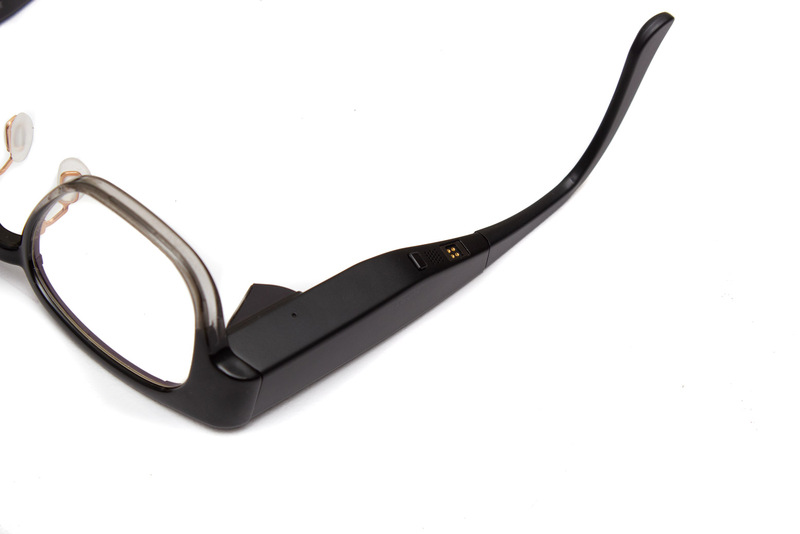 Instead of going for the bad sci-fi prop look, the Focals smart glasses actually resembles normal glasses. As smart glasses, Focals aims to provide only the most critical information as quickly as possible. Just like most bleeding edge tech, Focals aims to be something that you don’t realize you need until you have it. The Focals is not only smart in function, but in form as well. In the smart glasses market, it’s the most stylish looking product yet. Its projector is discreetly placed on the inside of the right leg and is easily missed at a glance. Due to its electronics, however, there’s no way to hide its thick legs, which also hold the battery. Also due to the electronics, the Focal’s can’t collapse as normal glasses could. Only the tip of the glasses folds inward. I won’t ding the Focals for using an all plastic construction to counteract all its extra weight. With that said, the plastic frame is quite flexible – worryingly so, in fact, especially around the nose piece. I was afraid to bend outwards too much in fear that it might snap. The joints between the leg and the lens frame are extremely sturdy, though. 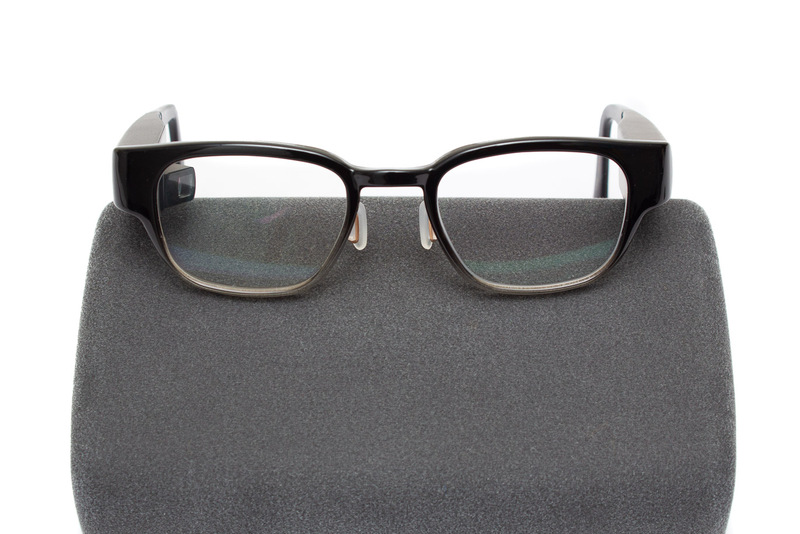 From the front, the Focals is hardly distinguishable from regular glasses. The reflective piece on the right lens is completely invisible. When it’s not sitting on your face, Focals isn’t meant to be carried in your pocket. Instead, it’s supposed to sleep inside the included charging case. The charging case feels quite sturdy and should protect the expensive glasses from moderate drops and bumps. On a full charge, the case can charge the Focals thrice. The power button and charging contact can be found at the bottom of the right leg. Also placed there are the speaker and microphone for Amazon Alexa. The Focals uses a little control ring, called the loop, to scroll through content. Just like the glasses, the loop is custom fitted as well. A little joystick sits atop the ring that doubles as a button. Similar to the glasses, the ring is not water resistant, and could easily be lost. North does offer replacements – albeit at a high price. 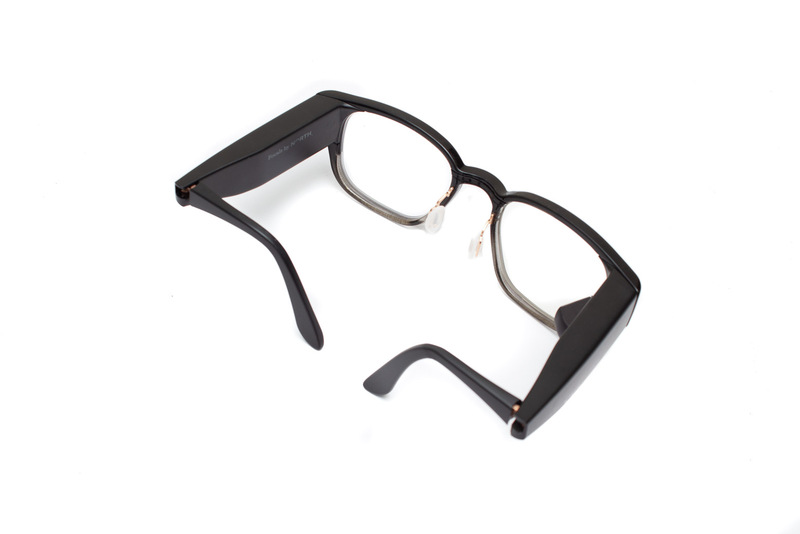 In addition to different lens styles and colors, the glasses supports external lens attachments. A lot of what will be said here has been covered in our previous primer, so feel free to skip this section if you’re already attuned to how Focals work. In principle, Focals work just like the Google Glass. They both redirect images cast from a tiny projector into the viewer’s fovea, the part of the eye that sees the clearest. 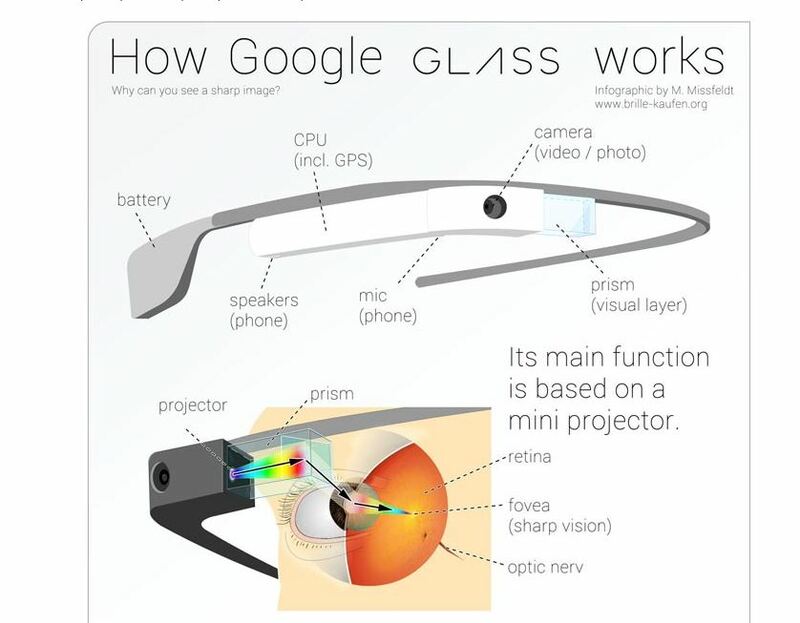 Whereas the Google Glass uses a protruding prism, Focals has the reflective piece installed in on the lens itself. 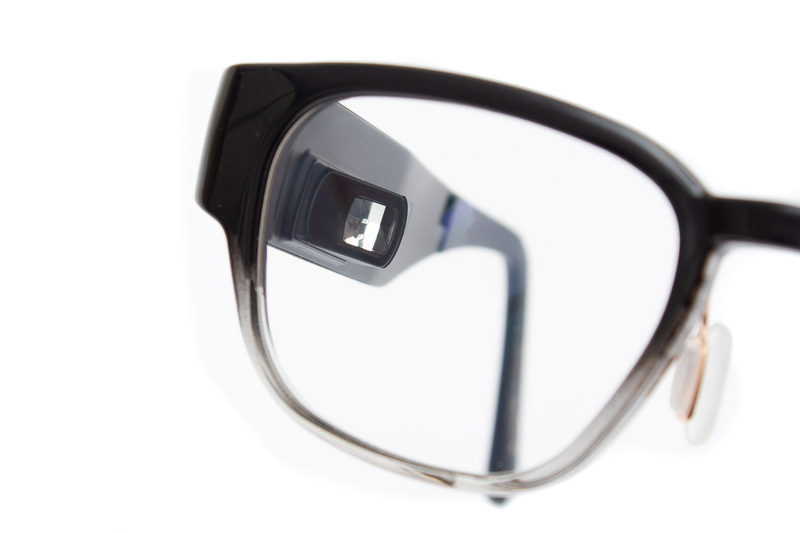 This eliminates the unsightly display block on the Google Glass, reducing its bulk and increasing its aesthetics. The reflective piece doesn’t affect focus and hides the projection from the other side of the lens. During my last interview with North, Aaron Grant, North’s co-founder, explained that while they can certainly implement transparent OLEDs to make Focals even more inconspicuous, the human eye can’t focus on a plane at such close proximity. In addition, there’s also a privacy problem since everyone else would also be able to read the display. In contrast to the Google Glass, the Focals doesn’t use a camera and only has a microphone for sending Amazon Alexa voice commands and voice-to-text messaging. Although this seems like a blunder, not including a camera reduces complexity and eliminates worries of inappropriate filming. In fact, the Google Glass was banned from hospitals and movie theatres for this exact reason. The point of Focals is to be a supercharged version of regular glasses. Therefore, it’s compatible with prescription lenses, which is why their fitting process also includes an on-site optometrist appointment. Every pair of Focals is custom made, and the right fit is critical. Fitting is actually a two-step process. In the first step, North uses a fitting station that tracks your eye movement and calculates the reflective piece’s exact position. Once the lenses have been made, the second calibration process ensures that the frame stays snug and fine-tunes the display’s sharpness. The display calibration involves no moving parts and is done entirely through software. From start to finish, crafting a single pair of Focals could take a few months, but North is looking to reduce that to just days. Focals is designed to provide only the essential information in a snap, but that doesn’t mean it’s simple. It can quickly display weather information, time, and compatible with most popular instant messaging apps including Facebook Messenger, WhatsApp, Google Hangouts, and Slack. It also supports quick replies for SMS so you can send pre-formatted responses if your hands are tied. In addition to messaging, Focals can also control navigation. Its navigation function is powered by MapBox. This is the feature I used the most throughout the review. Amazon account holders can enable the Alexa voice assistant – and it’s a good idea to do so as Alexa can accept more complex commands. It can call an Uber, read news briefings, and set timers directly through the glasses. All of the commands need to be spoken, though, so they don’t work as well in noisy environments. Taking screenshots of the projection may be impossible, nevertheless, the Focals smartphone app does have a feature that somewhat simulates what the user sees. It’s essentially just a capture of the projection stitched onto a photo background. Strangely, the Focal’s function set doesn’t encompass media controls and call pickup, things I considered basic when it comes to smart devices. When I asked Alexa to play music, she politely reminded me that it’s not supported on the device. Furthermore, I couldn’t get incoming call alert to work, a function that’s the backbone of Focals. I couldn’t make calls using Alexa voice commands, either. I had several concerns going into this review. The first is how shifting affects the display’s clarity. For example, when my head is tilted down while looking at my laptop, my prescription glasses would sometimes slide off my nose by a bit. This may not warrant an adjustment with regular glasses, but can throw off the Focal’s display focus. 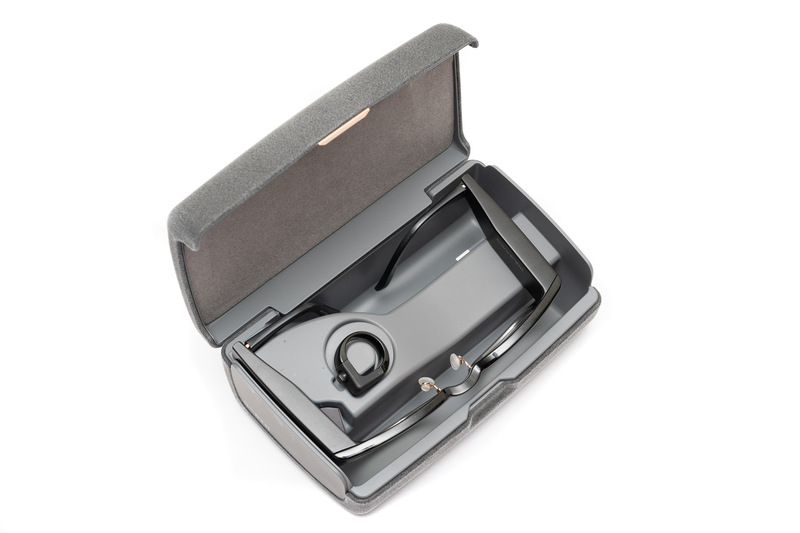 The glasses has an IP55 water and dust resistance rating, which indicates that it’s dust tight and protected against water projected from a nozzle. While you can’t shower with them, rain should pose no threat to the glasses integrity. The loop is even hardier with an IP66 rating and therefore should withstand dust, oil, and even powerful jets of water. The display boasts impressive sharpness, and I’m pleasantly surprised by the vibrancy of the colors. Texts and graphics have very defined edges and are not at all straining to read. The projector is responsive to the loop’s input commands, too, never lagging or falling behind when switching between information panes. The brightness can be dimmed to conserve battery, but even at peak brightness, the display can be hard to read against a bright background. With that said, the slightest positional shift can turn the display blurry. If I turned my head too quickly or bend over to tie my shoelaces, I would need to readjust the position to make the display sharp again. On the other hand, I have a very flat nose bridge, and even normal glasses tend to slide often. Using the Focal continuously for five minutes produces a noticeable amount of heat. When the heat source is constantly pressed against your temple, this temperature change is very pronounced. After 10 minutes, the projector became uncomfortably hot. Using an infrared thermometer, I measured a peak reading of 36 degrees Celcius. While being able to check message notifications is a huge plus, the best thing about Focals is the turn-by-turn navigation mode. When active, the Focals will display arrows telling you when to turn and how far to walk. The display doesn’t have to be on all the time, instructions are also fed through the speakers lest you turn it off. All the electronics makes the frame heavier than normal glasses. North has done an admirable job at trimming the weight down to a minimum, but the Focals’ weight can still cause the eyepiece to dig into my nose bridge. Something that I couldn’t anticipate is how Focals made me look when I’m using it. To an outside observer, It can appear as though I’m just blankly staring into space when I’m scrolling through my notifications. Unless they’ve been introduced to Focals beforehand, seeing someone with fish eyes standing on the street corner twirling his thumb on a ring can set off the creep alarm. 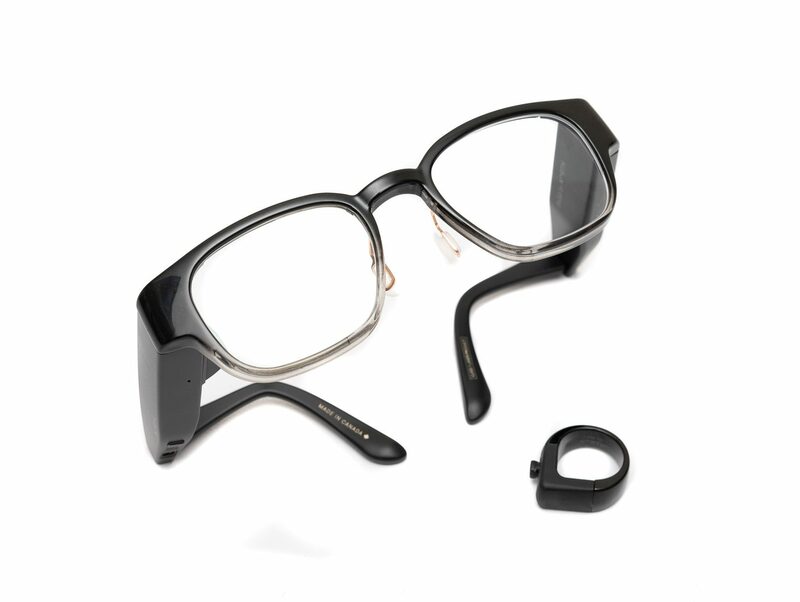 Everyone can benefit from Focals functionally. After all, every smartphone user would love to be able to read notifications and updates without having to pull out their phone. It’s discreet, too, so you can scroll through Facebook Messenger even if you’re in a meeting. The turn-by-turn navigation is supremely useful as well for exploring a city. As helpful as the glasses may be, North needs to address several flaws before its Focals can be considered an everyday device, mainly with functionality and certain technological limitations. Software features like media control would be a great asset to its feature list. It also turns uncomfortably hot after a few minutes of continuous use, and it’s still bulkier than regular glasses. Nevertheless, being a new product that tries to fill an empty niche, North has done an outstanding job at creating a pair of smart glasses that can truly be called consumer-focused. Being able to compress functionality into a design that isn’t glaring is a grand accomplishment in its own right.